Enjoy these photos of Andrew, including many on some easily identifiable sets. Andrew Rowan ’19 has been named the New Jersey High School Journalist of the Year by the Garden State Scholastic Press Association (GSSPA). He was honored at the New Jersey Press Association’s April 11 Spring Awards Celebration held in Hamilton. As the Journalist of the Year, Andrew is also the recipient of the Bernard Kilgore Memorial Scholarship ($5,000). Bernard Kilgore was the Managing Editor of the Wall Street Journal from 1941 to 1965 and head of the Dow Jones company. This annual scholarship recipient and award winner is selected by a panel of New Jersey newspaper editors. Andrew is now also entered into the competition for the National High School Journalist of the Year. Andrew, a Cherry Hill resident, has been the consummate scholastic journalist at Moorestown Friends School. For two years, he has served as the Editor-in-Chief of WordsWorth, the student-run news organization which disseminates news on multiple platforms, including print, digital, video, and social media. Andrew is the Editor-in-Chief of The Cupola, the school’s yearbook. In previous years, he served as Photo Editor. Andrew began on the yearbook staff in Middle School. “(Art Teacher) Mrs. Edmund saw I had interest in journalism and encouraged me to become the yearbook’s Middle School correspondent,” he said. Andrew has also worked for four years in the MFS Marketing and Communications Department. He wrote a number of news stories and features, and also produced several video projects including an “MFS Defined” video series, a video for accepted students, and an aerial tour of the campus using drone video. 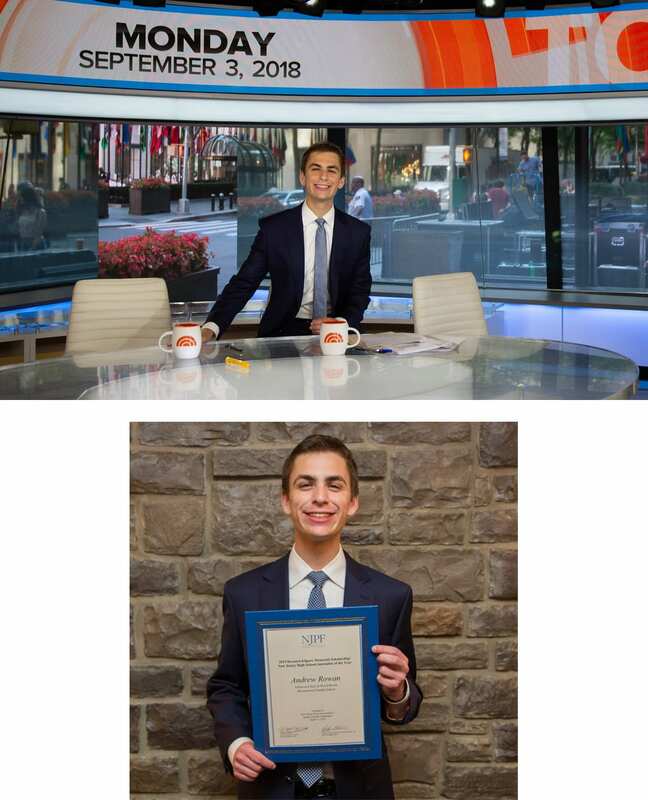 During his high school career, he has received an astounding 17 awards from the Garden State Scholastic Press Association, including six First Place awards. Andrew has also been inducted into the Quill and Scroll Society, the high school journalism honor society. This past summer Andrew attended the highly selective Northwestern-Medill Journalism Institute. Outside of school, Andrew has served as the Social Media Manager & Graphic Designer for Rockhill restaurant in Cherry Hill. He is also the Marketing and Communications Producer for Congregation Beth El in Voorhees. Andrew founded his own production company in 2013 when he was in seventh grade.